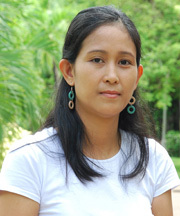 Ms. Phyu Sin is presently working as a Program Officer in the Agriculture, Resources and Environment (ARE) unit. In this capacity, her responsibility is to assist in designing, developing and implementing training curricula and proposals. She also has the experiences in coordination and management of professional development training program in the development management field in the area of financial management, human resources and performance management, and project management and quality assurance. She takes responsibility to prepare the budgets, logistics arrangements, activities and also coordinates with resource persons and field experts to ensure to meet the objective of the training and satisfaction. She obtained her Bachelor degree (B.Agr.Sc) from Institute of Agriculture, Yezin, Pyinmana, Myanmar with specialization of plant pathology in 1996 and her Masters in Gender and Development Studies from Asian Institute of Technology in 2008.